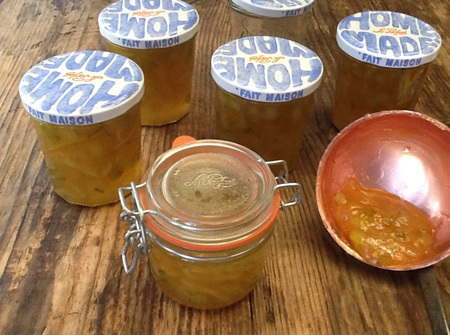 Courgette & Ginger Jam is delicious & a great way to use up overgrown courgettes / zucchini. 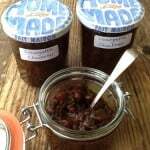 Perfect on toast & makes a great alternative to mango chutney! 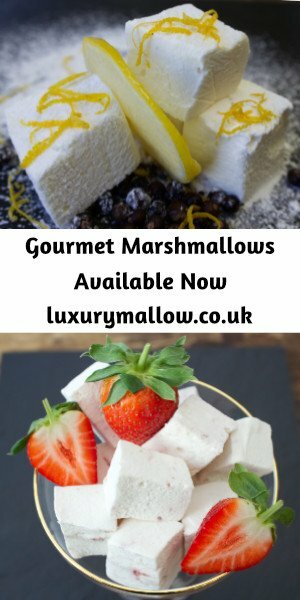 It still amazes me how quickly time whizzes by – this is my first post for August ! We’ve had family staying with us and I reckon sharing with guests is the best part of staying in France for the summer. Mind you, I have to be organised as we have a ‘first come first served’ booking system and I need to make sure there’s a day or so between visitors’ changeovers so I can change bedding and air the caravan or the bus. Missed and rebooked flights (one particular culprit shall remain nameless – and he is a repeat offender) meant I only just managed to wash and dry bedding and then make the beds all in one afteroon before my sister arrived at teatime. So I say, hats off to fellow bloggers who regularly post and still juggle their busy lives much better than I’ve been managing. It’s courgette (zucchini to our American friends) glut time here at the Kitchen Shed and I hope to share a few more of our favourite courgette recipes. Courgette & Ginger jam is delicious and so versatile – eat it simply on buttered bread (or toast) or serve it as an alternative to mango chutney along with poppadoms, raita and a tomato chutney. Courgette and Ginger jam has just the right amount of sweetness with the ginger adding a nice spicy kick without being too overpowering. A couple of tablespoons of Courgette & Ginger jam always find their way into my Christmas cake, mincemeat and my home made Seville marmalade as it makes a great alternative to candied orange and lemon peel. 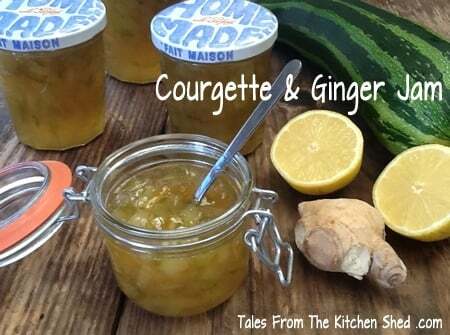 I used to sell our home made preserves here in France at a local Christmas market and Courgette & Ginger Jam was one of my best sellers. That said, here in Brittany some people are not very adventurous with spices and I think one or two locals were a bit bemused when they saw people buying a courgette and ginger preserve. When my French neighbour had a taste she was soon coughing and choking as she had never tasted ginger before and wasn’t expecting a spicy heat. I originally varied the amount of ginger in this jam recipe so it could be taste tested by our friends and then passed around to their friends. Of the three versions (mild, medium and hot) it was a pretty close run thing between the medium and hot. The recipe here is for a medium heat version Courgette & Ginger Jam but you could add 15 to 20 g more ginger if you are a ginger fiend ! I prefer to soak and pre-cook the lemon peel just like you would when making marmalade (we originally labelled the jars as courgette and ginger marmalade) as I reckon biting into a lovely soft jam and and then striking hard peel is a real let down. I like to sterilise jam jars in the microwave. Simply clean them as normal and rinse but whilst they are wet, pop them in the microwave for two minutes on full power. Remember the jars will be very hot, so remove with care. Always sterilise more jars than you think you will need. Juice the lemons and slice the peel into thin strips (don’t worry about the pith and pieces of lemon segment, they will disappear in the cooking). Place the juice, lemon peel strips and water into a small saucepan (cover with lid) and leave to soak overnight. Bring the lemon mixture to the boil and cook on a gentle heat for about one hour (keep the lid on) until tender. In a large jam pan add the diced courgette along with two tablespoons of the lemon liquid and cook on a low to medium heat until translucent and all the courgette juices have disappeared – about 20 to 30 minutes. Turn the heat down to the lowest setting and add the jam sugar and stir until dissolved. Attach the jam thermometer (if using) to the side of your pan. Add the lemon mix and grated ginger and stir. Increase the heat and when the mixture reaches a full boil, boil rapidly for 8 to 10 minutes. If you are using a jam thermometer, setting point is reached when the jam thermometer reaches 104℃. Remove your pan from the heat and test for setting point. Drop a little jam onto a cold saucer, return to the fridge and leave to cool for a minute. Push the jam gently with your fingertip, if the jam crinkles, setting point has been reached. If not, reboil for a couple of minutes and repeat until setting point is reached. Leave to cool for about 10 minutes before pouring into warm jars. Seal the jars as quickly as possible. Store in a cool dark place and use within 12 months. Preparation time does not include overnight soaking. Sterilise your jars shortly before they are to be used and make sure they are dry. This minimises time in which the jars might pick up new bacteria and ruin your jam. Credit Crunch Munch created by Camilla from Fab Food 4 All & Helen over at Fuss Free Flavours & hosted this month by Charlene over at Food Glorious Food. Amazing! I’ve never thought of making a zucchini (or courgette haha) and ginger jam before, but definitely being a ginger fan, this recipe sounds delicious! 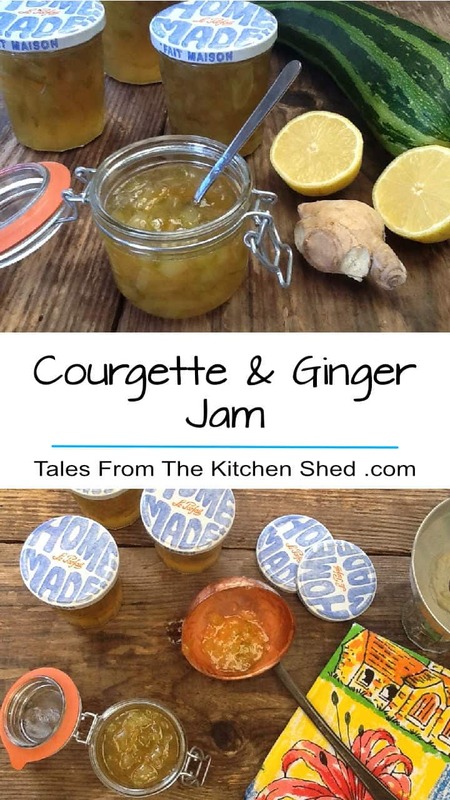 Thanks Justine, if you like ginger I’m sure you’ll enjoy courgette ( zucchini ) & ginger jam. 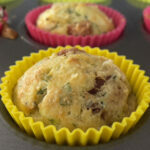 This sounds really unusual but tasty too – a great way to use up the glut, I’m sure! Courgette jam? That sounds amazing! I don’t think I’ve ever seen such a jam 🙂 Thanks for sharing it with us at Fiesta Friday! Thanks Sarah, it is delicious and definitely worth making. Thanks Janice, courgettes do cook quicker than older bigger marrows. What a pity you lost your courgettes, it was a late start here because of the cold May but luckily the plants have caught up. This jam sounds amazing! I also just love your jars! Thanks Julie, the jars are lovely aren’t they, they’re Le Parfait, I’ve only seen them here in France. Yummy in my tummy as my mini-mons would say. They love everything “jammy”. I like the idea of a spicy jam. mmmm. Too bad you weren’t selling this at my local farmer’s market… I would so make a special trip to buy! 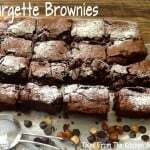 Thank for sharing this lovely recipe with #foodpornthursdays! 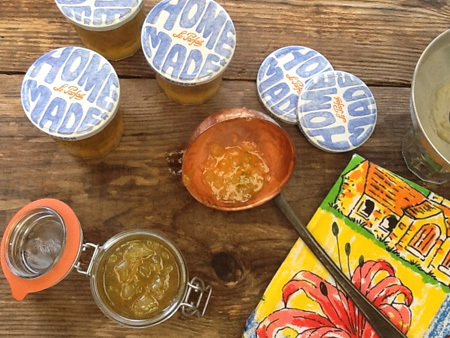 I have only just realised that you spent lots of time in Brittany – which explains those lovely French jam jars. The last time I tried a vegetable preserve I made the most horrible pumpkin chutney, I’ve not tried since. You’re welcome Helen. The jam jars do give it away don’t they? They’re a bargain too, 6,90 € for 12 jars from our local farmer’s co-operative. Oh dear, I suppose pumpkin can be a bit watery. This looks really good. Never thought of using courgettes this way before. What a great idea! I like the idea of serving instead of mango chutney! Thanks Jacqui, I have to make extra Courgette & Ginger Jam just for the poppadoms.